What is better than a plate ofChicken Fried Backstrap, mashed taters and green beans? Seems to me there is quite a bit of talk about “farm to market” and “farm to table” in certain parts of the culinary world. While this might be a new trend in the food world, this is nothing new to hunters. Hunters have been doing this since…well, since the first caveman picked up a stick or a rock and killed an animal. In Texas, hunting is a pretty big deal. Unfortunately, I’m a little late arriving to the party. I didn’t grow up hunting. It wasn’t something my family did. I did, however, marry into a family that has a ranch and knows about hunting. And I do have a brother-in-law who does quite a bit. This past Fall, I finally brought down my first deer! Although somehow in all the excitement, no pictures were taken in proof. What does this have to do with “farm to table”? I don’t know, but I think that its pretty cool that only the hands of three humans touched this backstrap: me, my brother-in-law who helped me field dress and process the deer and Mrs. G who helped me cook it last night. To me, that’s pretty cool. Backstrap cut into steaks, butterflied out and tenderized. I’ve heard jokes about how in Texas we like to chicken fry everything. I don’t know about everything, but if you haven’t had Chicken Fried Backstrap (from here on out I’m just going to type CFB), then you really are missing out. 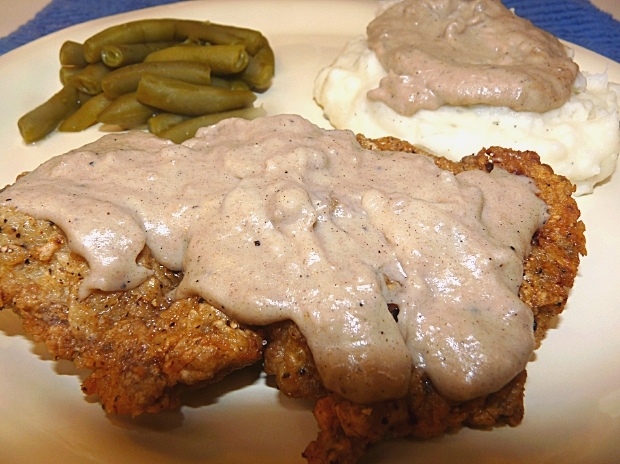 Everybit as wonderful as chicken fried steak, only more tender and with a slightly different flavor. If you ever get a chance to try some, I strongly urge you to take a bite. You’ll be happy you did. 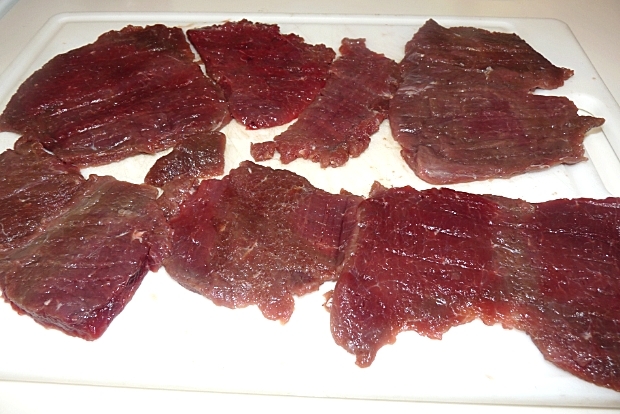 If not already done, cut your backstrap into 1″ steaks and then butterfly out. Place the steaks between wax paper and using a meat mallet (or other heavy object) flatten the steaks. This is a great way to take out any stress or frustrations. 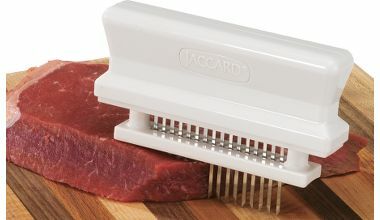 If you have a Jaccard, I’d recommend using it at this point to make it even more tender, but it’s not needed. Set up a simple breading station. Flour seasoned with salt, pepper, season all and anything else you might like in one bowl. Three eggs and 1/4 milk whisked together in another bowl. Fill a cast iron skillet with peanut oil about an inch to an inch and a half and heat to 350. 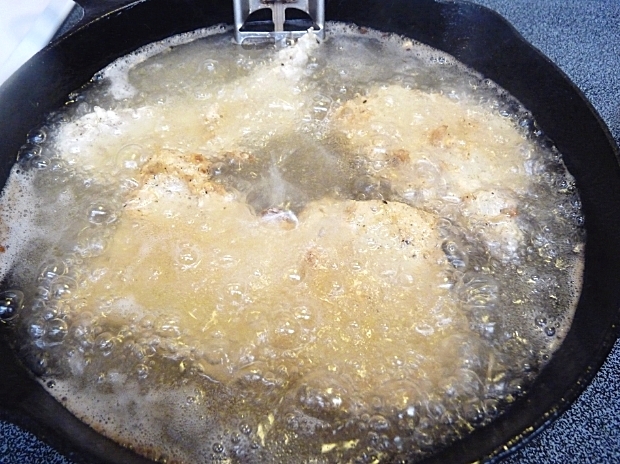 Lightly coat the backstrap with flour, coat with the egg wash mixture, back into the flour and then into the skillet. Cook until golden brown on both sides. Do NOT overcrowd the skillet, work in batches. Once golden brown, remove from skillet (I like to place on a cookie rack over a cookie sheet to drain. Check the next picture to see what I mean) and lightly salt. At this point, the can be held in your oven on the lowest setting (mine is 170) until ready to serve. From this point on, if you don’t know how to make gravy, my directions might not help much. This is Mrs. G’s job and she does it by feel after years of experience. Pour out the oil into a heat proof container keeping about 1/4 cup in the original skillet. Mix in flour and make a roux. While constantly stirring, add milk. Cook until you get the consistency you want, adding milk if it gets too thick. Season with salt and pepper to taste. If you don’t know how to make a gravy and you don’t have your own version of Mrs. G around, I’m sure there are websites that will walk you through it. Mrs. G lending a helping hand. 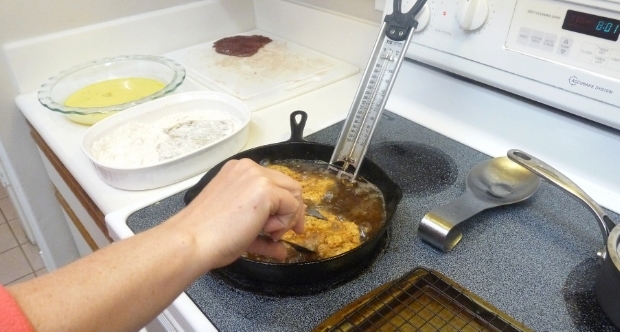 You can see our little breading station on the left and a thermometer in the skillet so we can make sure we are at 350F. As much as I love chicken fried steak, CFB is even better. My idea of a perfect meal. I’m not gonna argue with you about how to fill up the rest of your plate, but in my opinion it should be mashed potatoes smothered in gravy, some green beans and a few rolls. Unfortunately, I forgot the rolls, but still….heaven on a plate. Crispy, golden CFB smothered in gravy. 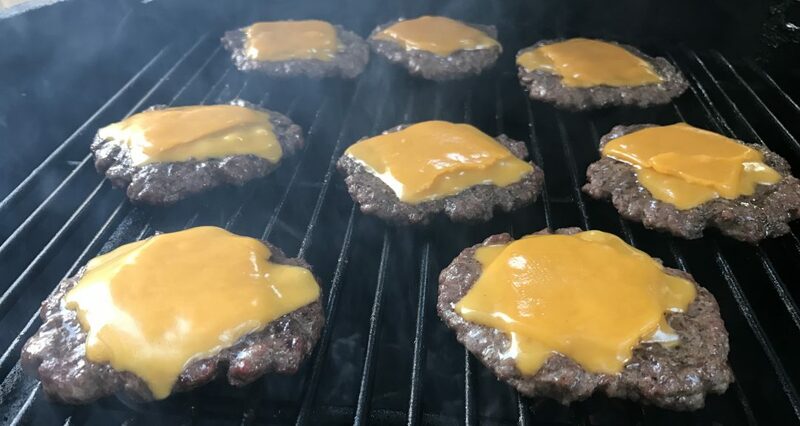 So tender it doesn’t even need a knife to cut and just melts in your mouth. Creamy, buttery mashed potatoes. And the pride and sense of accomplishment of knowing that you killed the deer, processed it yourself and then cooked it some how makes it taste even better. Life doesn’t get much better. And this weekend….we make sausage!! Mmmmmmmmm…………looks great! Your gravy is spot on – and that’s not always easy to do! I have to thank my wife for that. She does a great job with gravy. Thanks. I totally agree. I wish we could have a garden, but we’re in a rent house right now. We do some gardening in pots. Got some tomatoes, cilantro, basil, thyme and jalapenos right now. Gonna plant some more in a few weeks. I am super envious that it is warm enough to grow things there!!! It is in the 30s still. I long for warm. The joys of Texas I suppose. I guess it is a give and take. The dry and lack of green is almost as bad as snow and lack of green. Can’t get too much better than mashed potatoes smothered in gravy! Looks perfect! Thanks. Squirrels and possums…not so much. You can always use round steak or chicken breasts. Ha – looks familiar. Us old Italian hunters just call it Milanese. Best way to do Back straps and inner straps. Does look good though. Thank you. Milanese, huh? I’ll have to look that one up. Still got 1 backstrap and 2 inner straps (tenderloins is what we call them). Think the tenderloins will be grilled up. 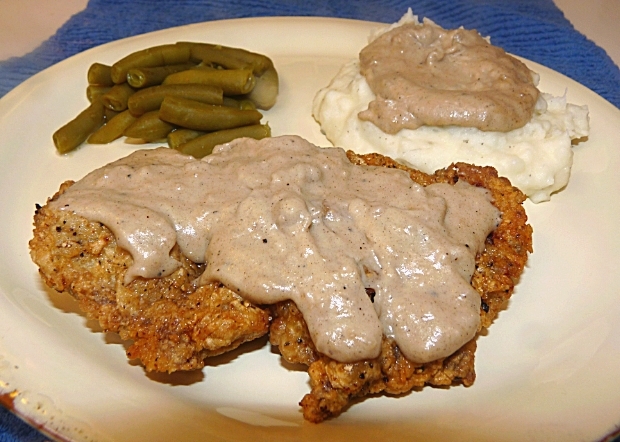 Now that looks good, chicken fried steak is a favorite of mine, breakfast lunch or dinner. Chicken fried steak (or venison), sunny side up eggs and hasbrowns. That is my idea of a breakfast! Thank you for the kind words. It really is easy, it’s all about making sure your oil is not too hot. Let me know if you try it out.